I’ll be honest, I have several high-quality reusable shopping bags that I always intend to use. But I hardly ever remember to take them into the store with me — even when they’re sitting on the seat in my car! A big reason I haven’t been more diligent with using reusable shopping bags is because most are just too small, and you still have to carry a ton of bags from the shopping cart to your car… then again from your car to your kitchen. Even with reusable shopping bags, that part is still a pain. But since I’ve had these 4 large Lotus Trolley Bags, I’m always looking for another reason to use them! Seriously. Where have these things been all my life?! Grocery shopping has never been easier. 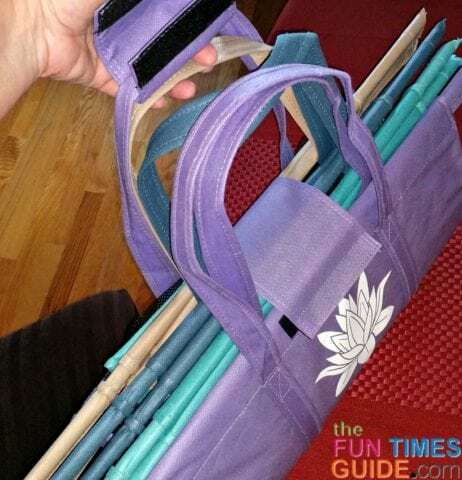 The husband and wife team at Lotus Trolley Bag recently gave me one set of 4 reusable shopping bags to try. 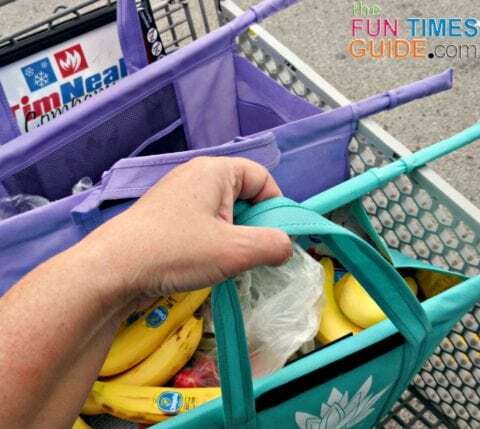 As most of you know, I only review products that I would actually use in my day-to-day life — and I knew right away that this set of shopping cart bags would be just what I needed to actually start carrying reusable shopping bags into the store with me regularly. I was initially impressed with the built-in side pockets… and then the durability… and then the colors. 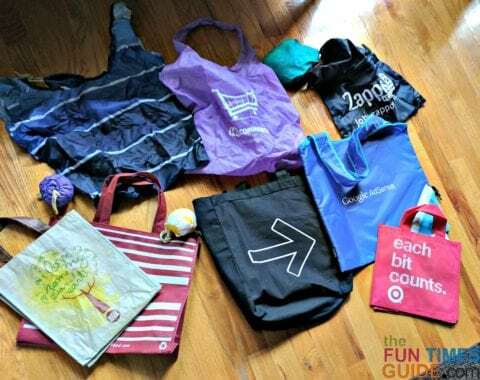 As it turns out, there are lots more features that I didn’t even know about at the time that have made these my all-time favorite reusable shopping bags! 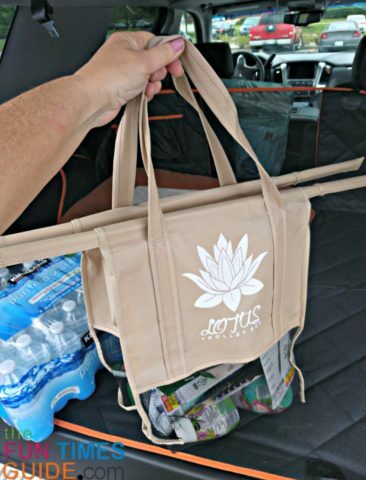 Farzan and Jen Dehmoubed are a small company success story, and I’m thrilled to share the details of their amazing Lotus Trolley Bag with others. #1 – Made from recycled plastic, the Lotus reusable shopping cart bags are incredibly durable. You might think of recycled plastic as being thin & flimsy, but no… these bags resemble heavy-duty luggage that’s made of high-denier Ballistic nylon and lasts forever. #3 – Not only that, but this sleek bundle of bags also attaches to the shopping cart handle with the large velcro flap (that holds the bags’ handles together when not in use) until you’re ready to fill them up at checkout. #4 – The 4 bags separate easily (simply pull apart each piece of velcro where the 2 bags attach to one another). This makes loading all 4 bags into your car — full of groceries — a cinch. #5 – I love Love LOVE the pockets that are inside the large purple bag! The pockets were designed to hold 2 cartons of eggs and 2 wine bottles — but they could actually be used to hold anything! I usually toss all of the little “extra” things I’ve purchased in there — like gum, gift cards, and prescriptions that I’ve paid for at the pharmacy counter. #7 – There are no separate pieces that you have to keep track of — like dangling velcro straps, strings, or outer wrappers. Nope, everything that you need to use these 4 bags and to re-fold these bags into 1 bundle is securely and permanently sewn on. #8 – There’s nothing hard, jagged, or metal to poke you or get in the way. The rods are covered in the same durable material that the bags are made of — and they’re removable! So, if you just want to take one of the bags somewhere (like the farmer’s market, or even the beach), your bag won’t look like it’s “missing” something. Each bag is a legit standalone tote bag on its own. 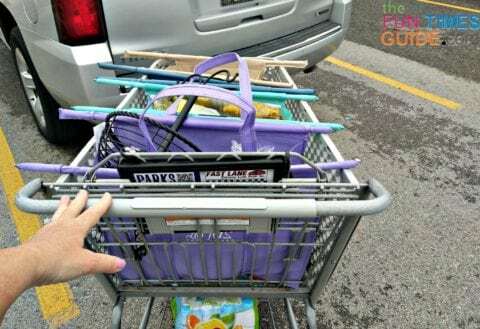 #9 – The rods that fit over a shopping cart are not “sized” in any way — so these reusable shopping bags will fit any shopping cart, large or small. #10 – The bottom portion of 3 of the 4 bags is a see-thru mesh material. At first, I feared that the mesh would “give” with heavy items inside the bag — or even tear. But no… it’s a strong and durable mesh. In fact, each bag can carry 50 pounds. I can attest to the fat that the mesh bottoms securely hold large, full-size bottles of laundry detergent, gallons of milk, household cleaners, and more. And the insulated cooler bag is even strong enough to hold a dancing toddler! But I didn’t have to!… Since each bag is slightly shorter than the one next to it, as long as you put the insulated cooler bag in the back (closest to you while pushing the cart) and the largest mesh bag (the purple one) next — then the last 2 shorter bags will nicely rest on top of whatever you already have in the cart. #12 – While there are 4 bags in the Lotus Trolley Bag bundle, you don’t always have to take all 4 with you on each shopping trip. For quick trips, you can easily remove 1 or 2 or 3 of the bags — and only take 1 or 2 of them with you into the store. 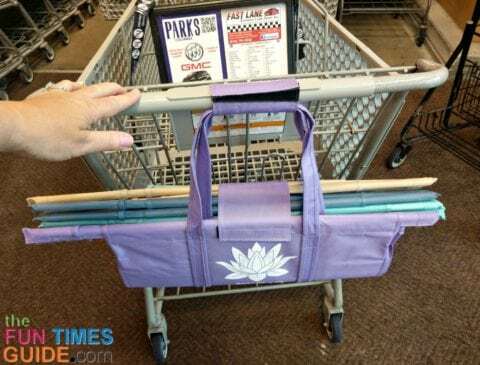 #13 – These 4 large Lotus Trolley Bags look attractive (I love the colors) and they’re practical (so easy to use — with no fussing at all). Several people in my shopping line have looked closely at the shopping bags I’m using and/or asked where I got them. #14 – When I get home from the store, I simply carry each bag to the nearest door handle in my house where the items belong. 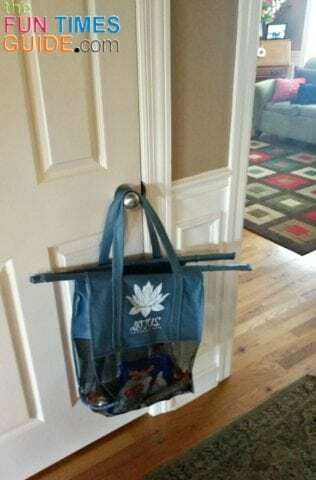 That way, I don’t even have to unload them from the countertop (like I do with traditional grocery store bags) — I can just put the items right into the pantry or the closet where they go without placing the bags on the counter at all. 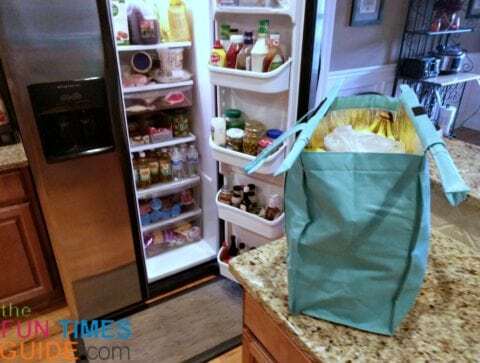 And by putting the cooler bag on the counter by the refrigerator, I don’t have to go far to place each item in the fridge or the freezer after shopping either. #15 – Most people who know me, know that I always try to think outside the box. Since the 4 bags can be easily separated from one another, and 3 of them have mesh bottoms… I think the Lotus Trolley Bags make the perfect beach bags! They won’t retain sand, and they’re fun “beachy” colors too. Plus, the cooler bag would be easy to tote to the beach with cold drinks and snacks inside! 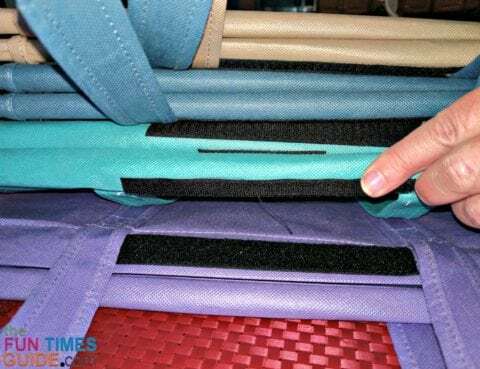 #16 – I used to use 2 foldable trunk organizers in the back of my SUV to get everything from the grocery store to my house. I like this particular trunk organizer — a lot — and it definitely kept the shopping bags from tumbling over in the trunk area. But it still required physically moving from the shopping cart to my trunk lots of individual plastic store bags (or reusable shopping bags)… and then moving those same bags again from the trunk organizer to the countertop inside my house. But with the Lotus Trolley Bags, I only have to make 2 trips max from my car to the house — carrying 1 Lotus bag in each hand per trip! NOTE: There are Trolley Bags similar to these on Amazon — without the insulated cooler bag and other enhanced features that make the Lotus Trolley Bags so durable and long-lasting. From what I’ve seen online, my vote for best reusable shopping bags definitely goes to the Lotus Trolley Bag set!